According to NAR Research the Median Income of Realtors was $34,900 in 2011, and those with lots of experience, 16+ years, had a Median Income of $50,200. The top earners, six figure income and up, were 17% of all Realtors or over 150,000 such agents. Obviously experience is a great asset and must be earned; the challenge in getting new agents to that level of experience as quickly as possible, requires boxing them in with a plan of action, and a mentorship program that the broker of the Office must strictly enforce. 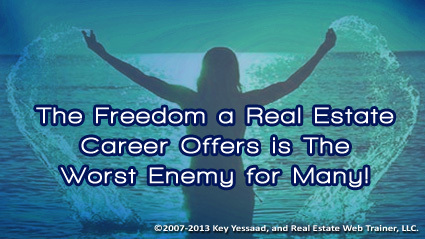 The amount of freedom Real Estate gives new agents is their worst enemy; and they end up developing bad habits and their income suffers as a result – they start chasing deals rather than developing the habits of prospecting, following up, and nurturing long terms relationships. The first 2 years of a Real Estate Career are crucial to the long term success in this business and many of our new breed of agents are on their own, making it up as they go along. We must also admit that the barriers to entry in this business are low, and the high compensation splits from the get go have not left brokerages with enough income to pay for mentorship, and for paying Brokers in Charge Salaries to nurture new talent. My question to our brokers is: Do you have a ‘New Talent’ Plan of Action that you trigger every time you hire a new agent? if Not, it’s best that you only hire experienced agents.